A cultivar of Camellia Japonica L., ‘Alba Simplex’ is a bushy shrub bearing medium, flat, single white flowers with a few pink flecks. [RHSE, Hilliers’]. 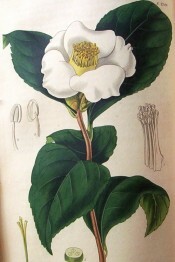 ‘Alba simplex’ was possibly introduced from China c.1818, although its origins are unclear. ‘Although the double white Camellia had been familiar in our gardens for some years past, yet the single white one continued so long a desideration with our florists, that they began to doubt the existence of it.’ [BR f.353/1819]. ‘The single white Camellia possesses the same claims to our admiration, as so many of the other varieties of the species, which promises to be as sportive, when raised from seed, as the Roses themselves. The plant in question [Camellia japonica flore simplici albo] is supposed to be the produce of seed from the striped Camellia [‘Variegata’], and raised by Mr. Rollinson of Tooting [in 1813].’ [BM t.2745/1827]. ‘The origin of this plant is not accurately ascertained, but it is most probable that it was raised from seed of the striped, which it resembles far more than any other in its foliage: the flowers too will sometimes have a streak or two of red among them.’ [LBC no. 636/1822]. Listed in the 1850 and 1857 catalogues [T.193/1850]. Desiderata to Loddiges’ nursery, 6th January 1845 [MP A2933-2, p.28]. This is the probable source. ‘Alba Simplex’ is listed in both the 1830 and 1836 editions of Loddiges’ Nursery catalogue, copies of which are held at Camden Park [CPA]. In the 1830 edition it is marked with a ‘+’, the meaning of which is unclear. In 1836 it is marked but the marking is worn and unclear.